China has a very rich heritage of arts and crafts dating back to the days of the early Chinese civilization of the Xia and Shang dynasties. Some of the prominent traditional crafts of China are: Paper-cut, Shadow Show, Silk Figurines, Embroidery, Chinese Painting, Lacquer Ware, antique furniture, woodcarving, Yixing Zisha Teapots and ceramic ware. Chinese painting is an important part of Chinese Culture. Chinese paintings have a long history. The art of painting originated in the late Zhou Dynasty, and developed in the Han Dynasty.One of China’s most popular folk arts is paper-cut. Its origin should be closely connected with the invention of paper during the Han dynasty (206 B.C.-221 A.D.). Paper-cut is used for religious purposes, for decoration and as patterns. Now paper-cut are chiefly used as decoration. The Chinese ornament walls, windows, doors, columns, mirrors, lamps and lanterns in homes with paper-cuts. They are also used for decoration on presents or are given as presents of themselves. Beijing silk figurines is a Chinese traditional handicraft. It was originated from the Northern Song Dynasty of China with a long history of more than 1,000 years. Beijing silk figurines draw their inspiration from the characters of folk stories loved by common people in China; such as ancient beauties, dramatic figurines and modern dancers, etc.Embroidery has a long standing history. High quality cloth and silk are used for the purpose. The art of embroidery was patronized by the various dynasties ruling China. Variuos traditional and contemporary designs are used in embroidering motifs and cloths of very high quality. China’s four famous styles of embroidery are those of Suzhou, Hunan, Guangdon and Sichuan. Lacquer ware is another very important craft in China. China lacquer ware includes 3000 varieties of craft items like screens, cabinets, tables, stands, boxes and plates made with traditional techniques of inlaying, painting, etching, cover-coating, wrapping with jades and stones and breaking veins. China has a long history in woodcarving. Picturesque in contours, concise in intended meanings, exquisite in chiseling skills, Based on customs and myths, its themes in general are classified into the following four categories: auspicious designs, figures for enjoyment purpose, local people’s life style, fowls and beasts, plants, vegetables and fruits that people are familiar with. 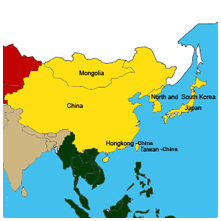 China is the home of chinaware, porcelain being produced in both the south and north. The long-lost techniques of the celebrated ancient porcelain kilns such as Longquan, Jun, Ru, Guan, Cizhou and Yaozhou have now been recovered, “like old trees putting forth new blossoms” as the saying goes. The purplish brown sandy potteries of Yixing, the noted pottery center in Jiangsu Province, are much sought after for their classic elegance and splendid luster. Hong Kong has a wide variety of arts and crafts with exquisite workmanship. They can be classified into special folk types. Special arts and crafts, such as ivory carving, jade carving and Shousan stone carving use precious or special materials, and undergo elaborate designing and processing. They are elegant and expensive. In technique, Hong Kong folk arts fall into the categories of cutting, bundling, plaiting, knitting, embroidering, carving, molding and painting. Cutting includes paper cuts, paper engravings, paper cut silhouettes, paper folding, paper sculpture, and leather-silhouettes, all of which evolved from paper cuts. Bundling includes kites and colored lanterns bundled up with paper, silk or bamboo. Plaiting, a popular folk art, includes various straw or thread plaited articles. The products include cloth tigers, cool pillows, cushions, tiny fragrant bags, colored silk balls, shoe-pads, and velvet flowers and birds. Knitting, including wax printing, bandhnu, color printing, drawn work and flower knitting, is created by weaving, knitting or stitching. Embroidering includes picture weaving in silk, printing and dyeing. Carving includes art depictions of various shapes, such as masks, puppet heads, figures, animals and flowers, which are created with bamboo, wood, jade or horn. Molding includes dough modeling, clay sculpture, frozen butter sculpture and pottery sculpture. The products serve not only as ornaments, but also as children’s toys. Painting involves such techniques as hand painting, incision, patchwork, and pyrograph, each having a style of its own. Handwoven textiles are a part of everyday life in Japan. In no uncertain terms, Japan is a textile country. There are four main fibers used in Japanese textiles: hemp, ramie, cotton, and silk. Ikat (Japanese: kasuri) techniques today are more popular than figured twills and satins. Two dyeing methods were used in Japan: immersion dyeing and painting. The former involves dipping a textile in a dye, and the latter is brushing on color. Both may be taken to heights of complexity, with multiple dippings of given areas in numerous colors, and a textile used as a surface for the painting of an artist’s dream. The designs are entirely freehand, and the technical flexibility and freedom of expression are limited only by the craftsperson’s own creativity. Indigo folk textiles such as quilt covers, hangings, and split curtains (noren), display complex, polychrome designs of felicitous motifs made with this technique. Japanese textile-dyeing stencils themselves are works of art and are collected. Closely linked with the spread of Buddhism in the area, embroidery was introduced to the province of Kaga from Kyoto in the Muromachi period (1392-1573) and was used for the decoration of such religious trappings as altar cloths and surplice worn by monks. During the Edo period (1600-1868), embroidery came to be used to decorate many personal items and such things as an over garment called a jinbaori, which was worn by military leaders when they went into battle. The kimono worn by noble ladies, too, were also sometimes embroidered, the dignified elegance of such garments pleasing them greatly. Though Japan has one of the world’s earliest dated and longest continuous pottery cultures (the Jomon culture; lasting from roughly 10,000 b.c. to about 300 b.c. ), there is no known direct continuity with today’s traditional Japanese pottery. Today, most Japanese pottery–besides porcelain, a small amount of earthenware, and Raku–is stoneware. Lacquer (urushi) has been an integral part of the Japanese lifestyle; it is taken for granted as part of life and treasured for its many qualities. It has been used as a protective and decorative coating material for at least six thousand years in Japan. Lacquer-coated earthenware pots and wooden combs have been found in Japanese Neolithic sites carbon dated to about 4500 B.C. Urushi has been used to coat such things as temple and shrine interiors; furniture and chests; sliding doors; walls and architectural interior trim; eating vessels of every type; casks, ewers, and bottles; personal accessories; chopsticks, lamp stands, paper products, and so on. Japanese joinery shares with its Chinese and Korean counterparts a delight in perfection. In architecture, structures were made by mortise and tenon, without use of pegs or nails. Architectural joinery is highly developed and has come up with various interesting developments, including ways to increase the length of a beam without sacrificing strength. The complex, puzzle-like joints of temples and pagodas never cease to fascinate and bewilder. Such joinery is why the “shrine carpenter” (miya daiku) is a profession separate from conventional house carpenter. Bamboo is most often used in Japan to make objects like madake and moso-chiku. Some types of bamboo grass (sasa), though botanically different from bamboo, are also used for basketry. Some other uses of bamboo in Japan are: fishing poles, particularly the telescoping kind; archery bows; musical instruments, such as shakuhachi and flute; chopsticks; tea whisks; a wide range of utensils for the tea ceremony, from tea measures to water ladles to wall vases for flowers; all kinds of boxes and vessels and containers made of the whole bamboo stalk (not woven); furniture, particularly stands and stools and benches; barrel hoops (twisted bamboo fibers); pipes (a long stalk split in half with nodes removed), and many more. Both metal forging and casting seem to have appeared as mature techniques in Japan. Japanese hand-forged carbon steel was and is among the finest produced by any people. Japan led the world in steel technology for perhaps a millennium, and today’s hand-forged Japanese kitchen knives are justly famous, as are carpenter’s and sculptor’s chisels and hand-forged scissors for household and garden use. There is evidence that stone craft accompanied Buddhism from Korea in the middle 6th century, and it is likely, though not documented, that stonework in the Izumo area dates from this early time. Stonework in Kyoto probably started in the late 8th century, mainly as foundations for temples and palaces, stone lanterns for temples, religious images, pagodas, and the like. Mongolian nomads’ homes, clothes, weapons , and way of life are impossible to imagine without Mongolia’s unique crafts, patterns, and embroidery. A special aesthetic has developed from the common things used in the everyday life of nomads over thousands of years. The beginning of the decorative arts in Mongolia dates back to pre-Bronze Age, with cave paintings. These can be found throughout Mongolia, but the highest concentration of cave paintings are in the mountains of western Mongolia, in the provinces of Hovd and Bayan Olgii. The Bronze Age saw the development of molten metal and zooform art. The Mongolian people also decorated various cloth with embroidery, developed applique, and stitched felt art. Hunnu goldsmithing technology developed rapidly, and since that time, coin design has been paid special attention by the people of this area. The Hunnu also developed pottery techniques, such as creating vases by hand or by a turning method with a lock up mechanism. The Syanbi people made fur clothes and traveling bags with perforated embroideries, and their women wore tall headgear. Uhuani peoples’ leaders were also their expert artisans: they were able to make bows and arrows, weapons, embroidery, woven items, and processed leather. During the Tureg Age, people created silver plates, golden jugs with floral motifs, and linear animal figures. The Uighur people were an influential group who lived in the 8th century. They made gold earrings, horses’ bits for the first time decorated by continuous ornament, and vases with wave motifs. People of the Khyatan state capably developed all kinds of craft and embroidery art because they viewed art and culture to be as important as politics and government. Many stone masons lived in this century. Also during this time, a process of firing pottery in green, yellow, and black porcelain and enamel was developed. The 19th and 20th centuries saw an energetic period of development of craft and decoration. Mongolian paintings, sculpture, embroidery, felt art, leather art, bookmaking, Buddhist prints, and bone, wood, and fossil amber craft work developed powerfully in this time. One of the best ways to understand ancient Korean civilization is to examine the tools and crafts that have been discovered in archeological digs around the peninsula A large number of relics from the Paleolithic, Neolithic and Bronze ages have been recovered. These artifacts provide scholars with valuable insights into life in ancient Korea and crafts from later periods reflect everyday life and values. Korea’s metal craft culture dates back to the Bronze Age in the 6th or 5th centuries B.C. A wide variety of bronze relics have been recovered around the country Of note are the Liaoning-type bronze swords first made in China in the 7th or 8th century B.C. and introduced to Korea in the fifth or sixth century. Animal-shaped bronze buckles showing a strong influence from the bronze culture of northern Eurasia have been discovered in North Kyongsang Province. Metalcraft reached a new level of sophistication during the Three Kingdoms period (1st century B.C-7th century A.D.) as evidenced by the relics recovered from tombs dating to that period. Most of the extant metalware of any importance comes from Silla tombs. Silla artisans created many art objects of great delicacy and elegance. The gold crowns discovered in Silla tombs represent the finest in Silla metalcraft. Metalcraft flourished with the introduction of Buddhism to Korea in 372 A.D. as ritual implements, such a temple bell gongs, incense burners, water sprinklers, sarira cases etc. Silla tombs have produced a number of beautiful examples of glass and curved jade pieces. Glass, jade,agate, crystal, and pure gold were made into curved ornaments to be hung on gold crown pendants and necklaces. Korean furniture is unique for its simple, sensitive designs, compact forms, all emanating from the Korean custom of sitting and sleeping on the floor. Choson woodcraftsmen were famous for their attention to detail and the blending of practicality and beauty. The use of glue and nails was avoided whenever possible by fitting carefully cut parts together. White bronze, bronze, copper, and iron were most frequently used for hinges, padlocks and decorations. Iron ornaments blackened with perilla oil and soot were favored for their simplicity and practicality. Lacquerware inlaid with mother-of-pearl dates back to the Silla period, and Chinese accounts refer to a highly developed lacquerware culture during the Koryo period. Tin or bronze wire was used to depict the ines, and sometimes pieces of thinly sliced turtle shell, tinted yellow or red, were used for variety. Chinese art began a long time ago, in China’s far off history. Even before the Tang Dynasty (618-907AD), the “golden age” of human figure drawing existed with line drawings of people in various actions. By the mid-Tang Dynasty, paintings featuring landscapes, flowers, and birds took flight. Mountains, forests, fields, and gardens became the focus of artists as landscapes had the capacity to divert one away from the exasperation of the material world into a peaceful realm. Rulers of ancient China supported the art of painting. Some established art academies while others were merely lovers of art. Chinese artists prefer to paint to their own liking and without limitation. Free expression is their key motto. Their fondness for natural subject matters allows them to better utilize the brush and ink’s latent talent. Realism does not play an important role in Chinese paintings. The effects of shadows and light are not the main focus in a painting. However, the basic component of Chinese art is the line, as it is in Calligraphy. Taiwan’s folk arts are part of its traditional culture. Many of the crafts were evolved to celebrate the agricultural season festivals. The different forms of Taiwan’s folk arts are: dough sculpture, fine arts, kite flying, Taiwanese opera and umbrella making. Taiwan’s diverse folk arts are part of its traditional culture. Many of the crafts were evolved to celebrate the agricultural season, festivals, and major days in people’s lives, such as birthdays, marriages and deaths. Paper cutting is one of the oldest folk arts. Red paper cutouts are pasted onto walls and windows to give homes a festive look. Knotting, or macramé, is used to make jewelry or wall hangings. A traditional craft of the Hakka people is the making of oilpaper umbrellas. The Hakkas in the town of Meinung in southern Taiwan feature a dazzling display of lion and dragon dances, the origins of which can be traced back to ancient China. The crafts of Japan can be categorized into the following categories: weaving, dyeing, braids, embroidery, pottery and porcelain, lacquer, wood, bamboo, metal, buddhist altars and accessories, paper, stationary, stone, dolls, crafts materials.